Please Help Us Put This Problem To Sleep! We are currently crowdfunding the launch of our product and advocacy campaign. Please contribute to our IndieGoGo campaign, every contribution counts! Almost half of all newborns develop flat spots by their second month. By simply turning your newborn's head each time he or she sleeps, as the AAP recommends, you can prevent flat spots. We are committed to putting this problem to sleep by reminding parents and caregivers to "Turn Your Baby!" 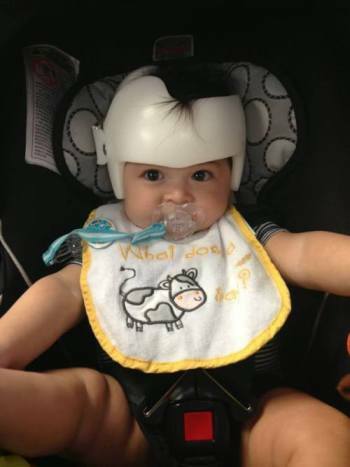 Turn Your Baby was started by Irene Collado when her son Lucas was treated for flat spots in 2013. She was very upset by the thought of using a helmet to correct his flat spots. So when she later learned that flat spots can be avoided by regularly turning a newborn's head each time the baby sleeps, the proverbial light bulb lit up in her head! - remind parents to "Turn Your Baby!" But it’s not that easy. In order to choose a different head position each time the newborn sleeps, the parent must also remember what head position the baby slept in last time. That's when Irene imagined the Turn Your Baby device, with three light-up buttons that help you keep track of a baby's sleeping position. Irene Collado is co-founder and co-inventor of Turn Your Baby (along with her brother David). She conceived of the problem and solution when she suffered through her son Lucas’s bout with flat spots in 2013. She has a master’s degree in nursing from University of Miami and is currently the Practice Manager at a Miami brain care clinic. She lives in Miami Beach with her husband and two sons. David Collado is co-founder and co-inventor of Turn Your Baby. He holds a JD from Cardozo School of Law (2014) and an MBA from University of Miami (2009). He is also a registered patent agent. After studying marketing and entrepreneurship in business school, David focused on intellectual property and Internet law in law school. Dr. Chad Perlyn, MD, PhD, is a Miami-based pediatric craniofacial surgeon and expert on plagiocephaly (flat spots). As the physician who treated Irene’s son, Lucas, Perlyn was the obvious person for Irene and David to turn to for feedback on their idea. Dr. Perlyn immediately identified with Turn Your Baby’s mission and was impressed by the design of the product, so he agreed to join the team as Medical Director and product champion.